The Energy assessment for Hart van Holland is part of a three year project developed for ten neighboring municipalities, willing to work collectively on a shared agenda for the Omgevingvisie 2040 (Environmental Vision). This agenda includes classic urban topics and is enriched by the spatial implications deriving from sustainability goals and targets regarding energy, mobility, waste and urbanism. The first layer to be explored is energy, as the region has explicitly stated its ambition to become energy-neutral by 2050. This means that within the region, the amount of energy used will be equal to the energy produced. In order to investigate opportunities, all possible sources for sustainable energy were mapped and assessed in terms of future potential, possibilities for spatial quality enhancement and synergies with other regional challenges. This research reveals the seven steps to overcome the challenges related to the transition to a sustainable, renewable energy. The first four steps consist in investigating the amount of energy currently available in the region and what is the potential for the future. The last three steps suggest a link between strategies at a regional level and spatial projects at the street level. The study shows that the region can be 100% neutral; however it would require an intricate mix of sustainable energy sources to accomplish this. 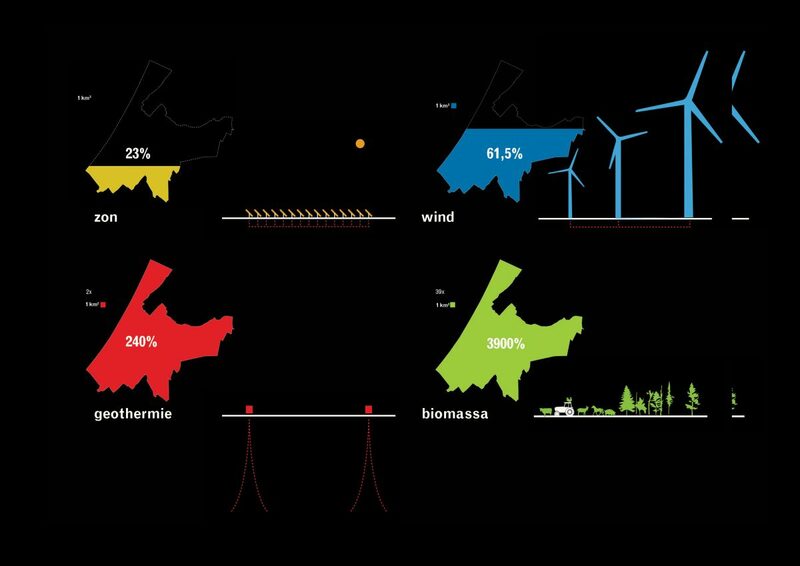 Amongst others, the study recommends windmills on the border of the natural reserve ‘het Groene Hart’ (9,6 PJ), biomass producing farmers (0,6 PJ), a heat network connected to the port of Rotterdam (3 PJ) and solar panels (6,5 PJ) in parts of the dunes. 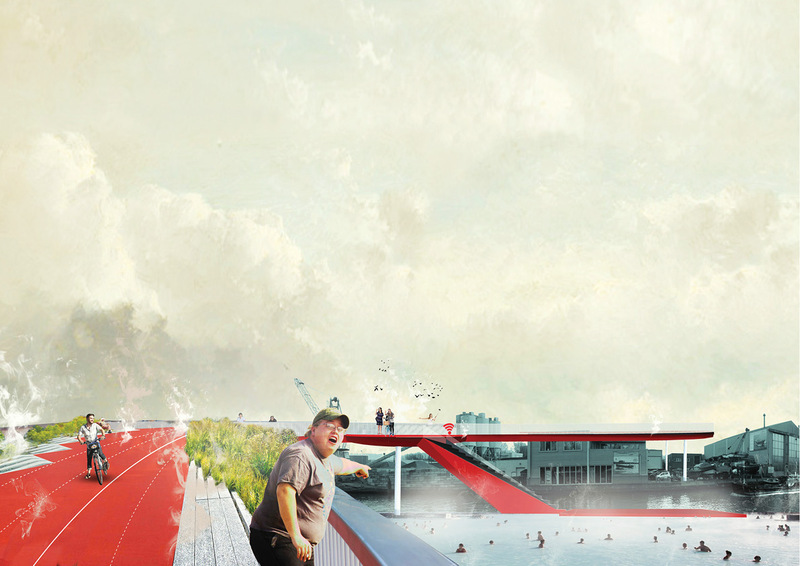 The project for Hart van Holland was awarded by the Ministry of Internal Affairs with the Aan de Slag Trophy (‘To Work’ Trophy), which celebrates pioneering environmental visions. Surface occupation in relation to energy production with sustainable resources. How much surface would be required meeting 100% of the demand with Solar (top-left), Wind (top-right), Geothermal (bottom-left) or Bio-mass (bottom-right). 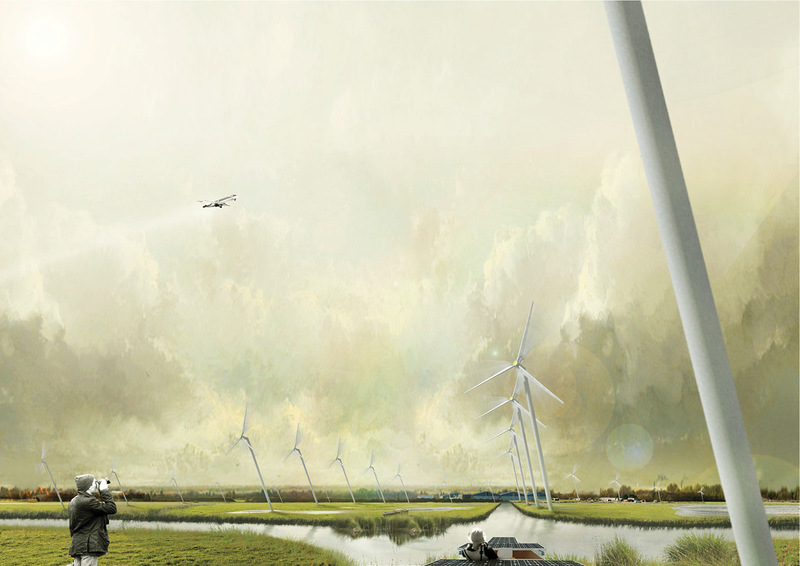 Concept visualization of a wind park with rotating wind turbines, adjustable according to the direction of the wind. 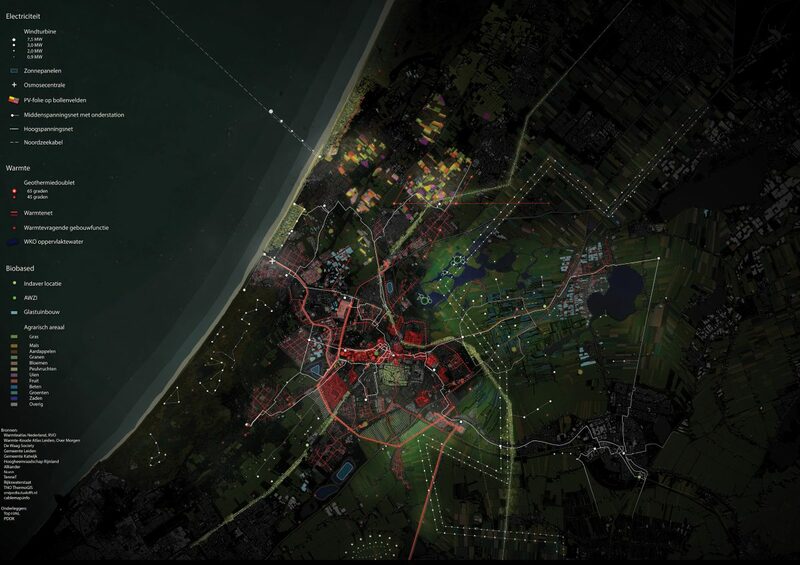 Concept visualization of an integrated system for heat network and cycling path. The two infrastructures are combined to reduce construction costs and take advantage of residual heat loss to improve the biking experience in winter time. 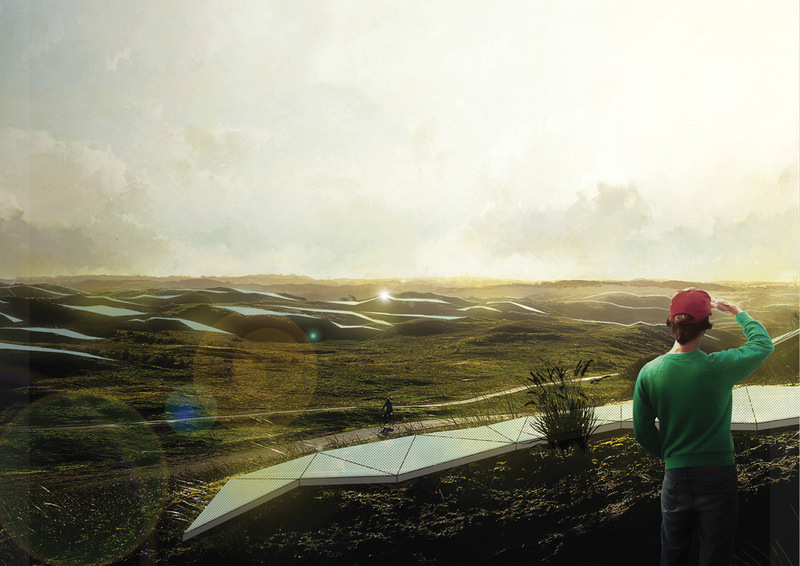 Concept visualization for the Solar Dunes, an integration of pv panels in the landscape. 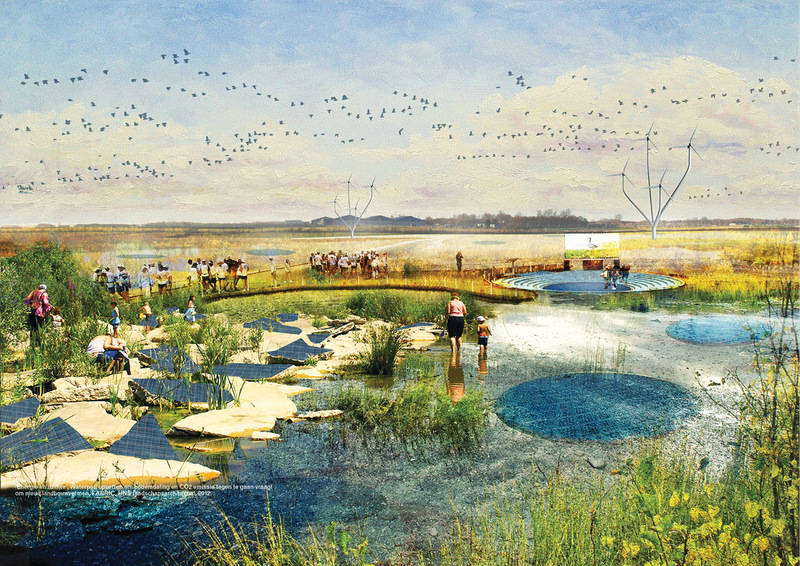 Concept visualization for a energy park, where sustainable energy production and biodiversity coexist in a non invasive equilibrium, and generate a new economy around eco-tourism.